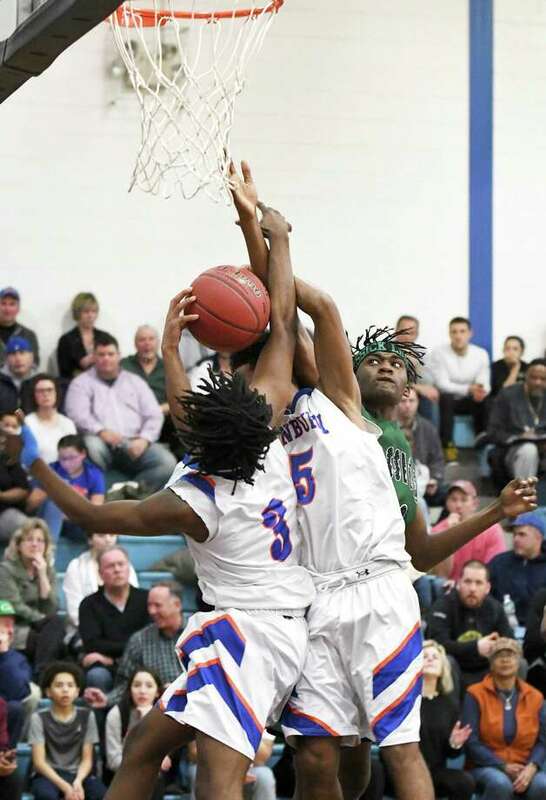 Danbury’s Keyon Moore, left, and Javon Hernandez bring down a rebound from Bassick’s Isaiah Sullivan, right, during their basketball game at Danbury, Feb. 4, 2019. Senior Kevin Crawford made up ground to chase down a seemingly lost cause on a potential uncontested layup for the Hatters. But nothing went uncontested Monday as he leapt sky high to swat away two points with a sensational block. Crawford’s dunk soon after was icing on the cake as No. 4 Bassick pulled away from No. 9 Danbury 63-52 in a non-league matchup between two of the top programs in the state. The 6-foot guard went full extension to deny a layup at the backboard, which eventually led to two points the other way. Bassick contested virtually every shot at the rim improve to 15-1. The Hatters — who had their 10-game win streak snapped — stuck around for most of the contest, trailing by just six points early in the fourth quarter. Then came the block, which was followed by an 11-4 run that pushed the lead to 59-48 as the visitors were able to push the pace. Crawford finished with a game-high 21 for the Lions while Emery Linton added 13. Keyon Moore scored 17 points for Danbury while Denali Burton led the hosts with 19. Moore hit several long triples to keep the score close throughout. The Lions went 11-for-25 on foul shots in suffering their first loss last time out against No. 2 East Catholic, but that was immediately turned around Monday. Bassick connected on its first eight and finished a stellar 23-for-27 while Danbury went 12-for-21. Jordan Gallimore, Bassick: Led the defensive charge inside and had a positive night scoring, finishing with 17 points. Kevin Crawford 9 3-6 21 Jermaine Grant 1 0-0 2 Julio DeLos Santos 0 2-2 2 Emery Linton 1 11-12 13 Jordan Gallimore 6 5-5 17 Jason Marrero 1 0-0 2 James Hernandez 2 2-2 6. Totals: 20 23-27 63. Denali Burton 7 5-9 19 Keyon Moore 5 4-4 17 Javon Hernandez 3 2-2 8 Jah Joyner 1 0-0 2 Jaden Cook 1 1-6 3 Raimir Rivera 1 0-0 3. Totals: 18 12-21 52. 3-pointers: D—Burton 2, Moore 3.